The Roppongi gallery will operate at this time according to its regular schedule. 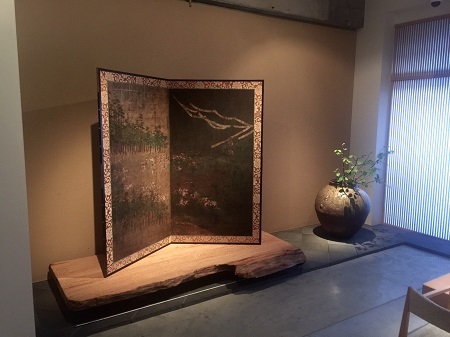 We hope that you enjoy the Golden Week holidays, and look forward to seeing you at the Shirokane Art Complex booth at Art Fair Tokyo next month! We hope this finds you well as the cherry blossom season has passed and the fresh new leaves of spring are beginning to emerge. We hope too that you will take the time to stop by our Shirokane location to see the latest exhibition, which includes this screen, perfectly suited for the upcoming Children's Day holiday. From the Kamakura period, a variety of events thrived to help build the courage of young boys. One of them was a mock battle in which boys would split into two groups and fight it out by throwing rocks at one another. Traditionally held on the fifth day of the fifth month, this event was called "inji uchi". It was quite a dangerous affair, however, and many injuries were sustained, sometimes even resulting in the death of participants. 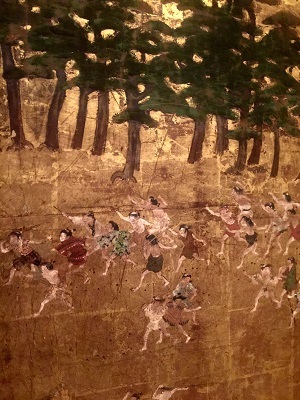 In medieval times adults also participated, but by the Edo period it was a game only for boys, and was eventually prohibited. This piece was most certainly made to be displayed around the time of the traditional Boy's Day celebrations, with the hopes that young boys would grow to be brave and strong. We hope you will take advantage of the opportunity to come see it! ※ Please note that certain exhibits will be rotated during this period.